The building was squat and old. We used a lot of older equipment, which was alright because it felt like they had a history of use. It made me feel closer to the UConn art program to be using things that other students had used in the past. We used old benches and tables. It always smelled strongly of oil and other chemicals. The presses were fun to learn, and the entire processes involved with printmaking were very intricate. I produced some of my favorite work from UConn there. UConn’s Print Shop, formerly located on Route 195. 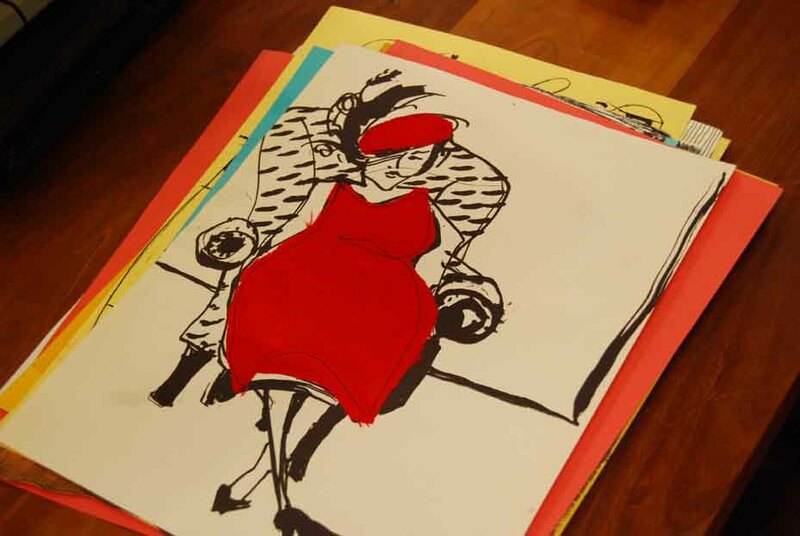 Kristin Eshelman reviews some of the student work discovered in the Print Shop. 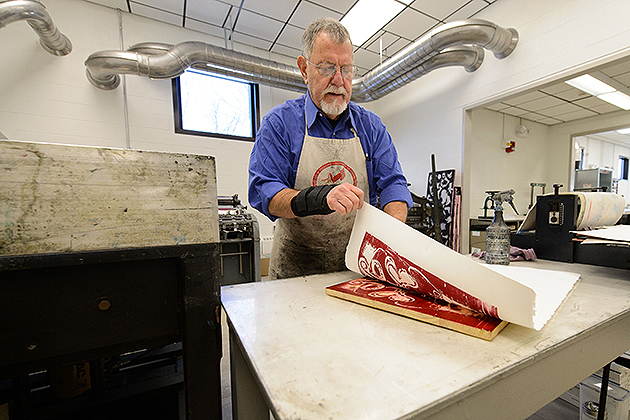 Gus Mazzocca, professor emeritus of art and art history makes a print at the new printmaking facility at the Bishop Center. 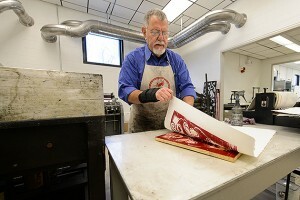 Gus Mazzocca, professor emeritus of printmaking, taught at UConn for four decades until his retirement in 2012. 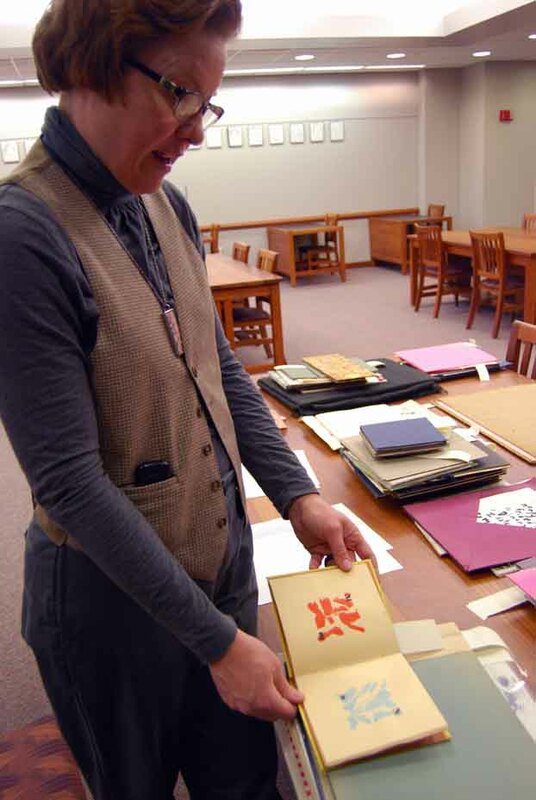 As Mazzocca’s rich and distinguished career was drawing to a close and as the UConn print shop – the small, old white house on Route 195 – was scheduled to be replaced by new, more modern quarters in the Bishop Center, Mazzocca contacted Kristin Eshelman, curator of multimedia collections in Archives & Special Collections. 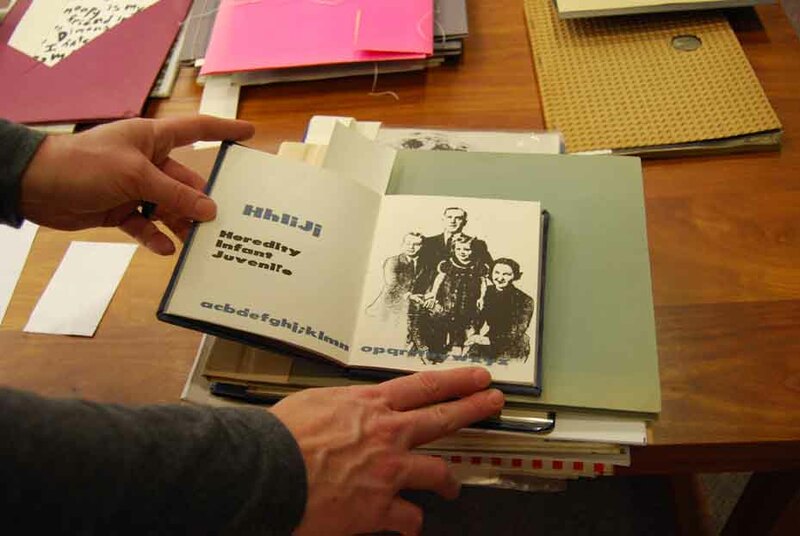 His question: was she interested in acquiring several decades of work made by students in his lithography course, specifically 146 artists’ books? Her answer: a resounding ‘yes’! 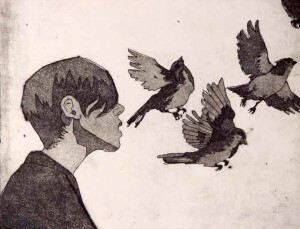 Mazzocca began teaching lithography in 1971 and continued until his retirement. Revived in the 1960s as a creative medium, lithographs became less expensive to produce with the introduction of aluminum plates instead of lithographic stones. Art school programs could then afford to offer lithography and the resulting use by artists peaked in the 1970s and 1980s. The greatest volume of student work preserved by Mazzocca dates from the 1980s. Not only is the work reflective of popular culture during Mazzocca’s tenure, but Eshelman believes closer inspection will reveal other printmaking techniques and the influence of visiting artists. Professional artists already identified include master book binder Terry Buckley of the U.K who was among those who participated in special curricular programs sponsored by the Art Department. Student work from the 1980s will be included in an upcoming exhibition entitled, “Out of the Frame: Alternative Arts of the 1980s,” in the Gallery in the Dodd Research Center beginning in March. To learn more, contact Kristin at Kristin.eshelman@uconn.edu. 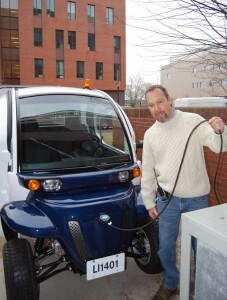 The Libraries’ David Avery takes a moment to “fuel” the new vehicle in an outlet at the loading dock. 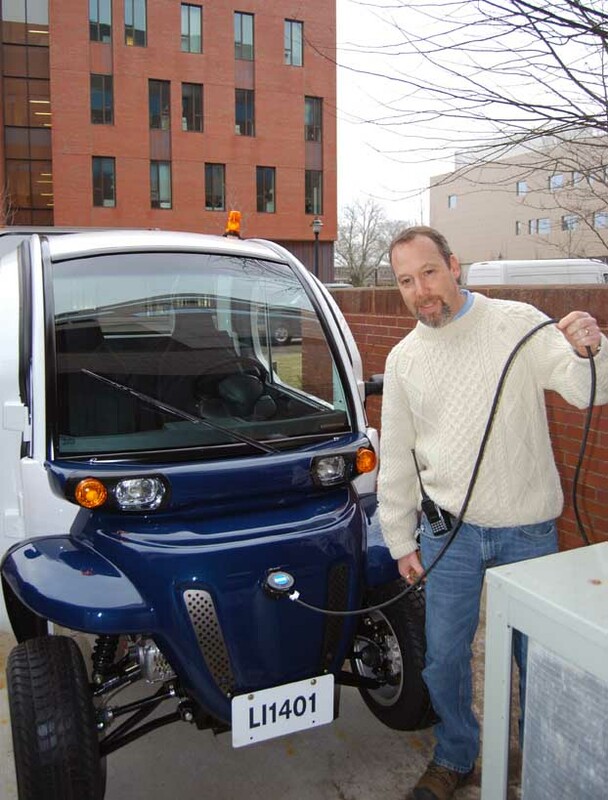 The new GEM light utility electric vehicle takes up residence at Babbidge Library. 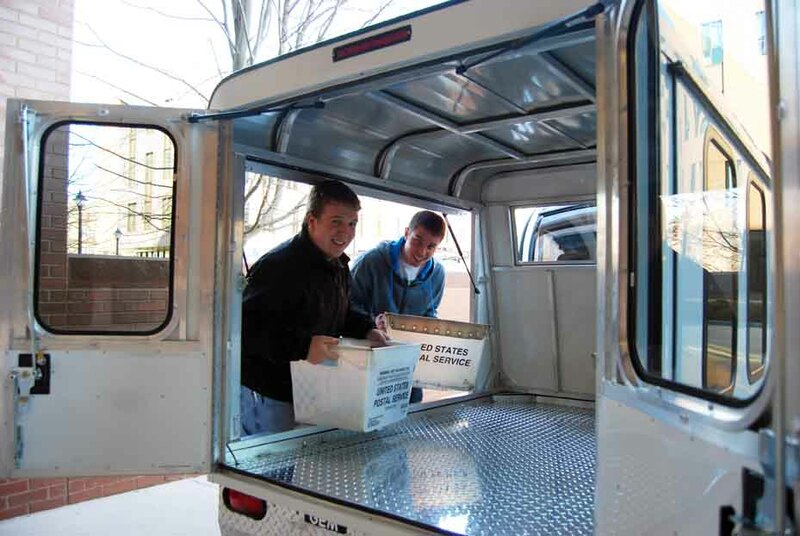 Student workers load books into the new vehicle for delivery on campus. The UConn Libraries are leading the charge in a new environmentally conscious initiative on campus with the acquisition of a new light utility electric vehicle. 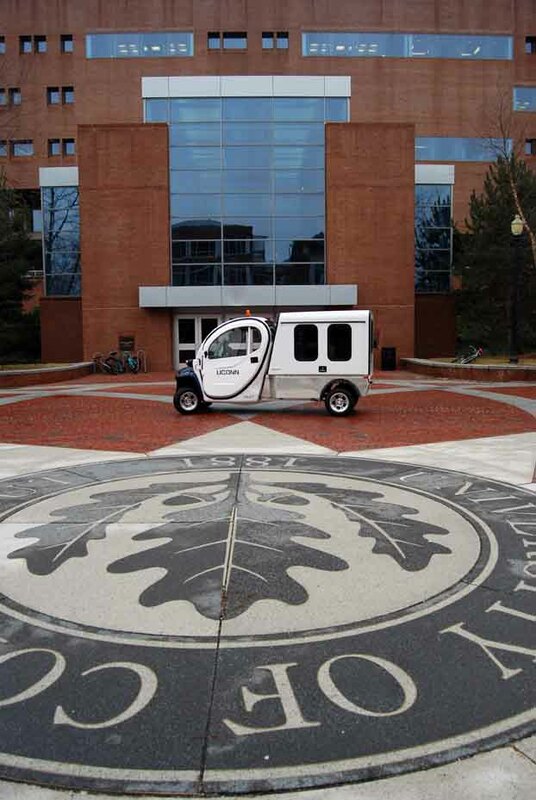 The vehicle, a GEM, manufactured by Polaris, will replace the Libraries’ 15-year-old gas powered delivery vehicle and is the first of six similar vehicles acquired through Transportation Services for use by campus departments. 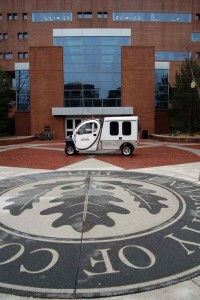 Delivered in mid-January, the new vehicle will continue to be used to make daily deliveries of interlibrary loan books and books from Circulation to the Music & Dramatic Arts Library, the Pharmacy Library, and the Dodd Research Center, as well as to pick up materials on campus destined for the Libraries. “We’re really pleased with it because we’ll no longer be faced with the mechanical repairs of an aging gas-powered vehicle. Plus, it’s green, so we’re adding yet one more environmentally sound element to the University’s environmental stature,” said David Avery, Facilities/Security Librarian. Last year, UConn won the top spot as Sierra magazine’s Coolest School nationwide for its efforts to encourage sustainability, green technology, and environmental stewardship. Other familiar green features at the library include bicycles loaned through the campus “UConn Cycles” program, and recycling containers for consumer products such as used sneakers and computer electronics. Classified as a low-speed vehicle, the vehicle has a top speed of 25 mph, a cargo capacity of 1,100 pounds, and boasts zero emissions. Similar vehicles are used by cities, municipalities and government offices, other colleges and increasingly by athletic and recreation venues, which use them to transport injured players off the field. 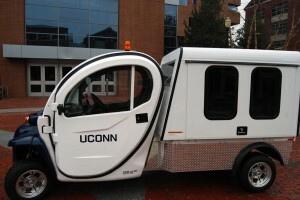 Equipped with six regular car batteries that charge via a regular 110 volt outlet with power provided by UConn’s own energy generation plant, the new vehicle’s mileage is the equivalent of the high 30s mpg to 50 mpg, and costs the about 2 to 3 cents a gallon to operate, according to Charlie Grab, Business Services Supervisor, of UConn’s Transportation and Motor Pool, who coordinated the purchase. In addition to those impressive operating statistics, Grabb says, the vehicles also hold their value. Although relatively new to UConn, early reports by users are positive. The vehicles will be routinely maintained by the campus Motor Pool mechanics, Grab says, and will go to the dealer for more specialized service. 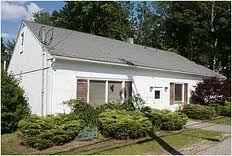 The purchase was offset by a grant from Connecticut’s Clean Energy Fund. “They’re all around cool,” Grab observed. 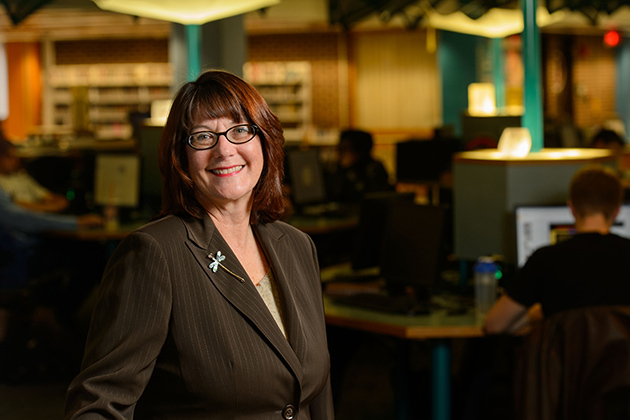 Martha Bedard joined UConn as vice provost of University Libraries in October. A Massachusetts native, she graduated from Fitchburg State College with a bachelor’s degree in English and earned a library degree from Simmons Graduate School of Library and Information Science. She says her career trajectory began when she moved from public libraries to a position at Harvard’s Medical School Library, where she discovered she loved working with patrons in a very specialized setting. That realization led her to the directorship of a small hospital library and later to a larger academic medical library, both in Massachusetts. Growing weary of New England’s winters, she headed south to warmer climes and to several leadership positions at the University of North Carolina-Chapel Hill, and later at Texas A&M University. In Texas, she was selected for a fellowship in the Association of Research Libraries’ first Leadership Program, an extensive two-year initiative that exposed her to the workings of several large research libraries. She was appointed as dean of university libraries at the University of New Mexico in 2007, a position she held until she came to UConn. After a 20-year absence, she says she is pleased to be returning home to New England. She has been able to spend time catching up with family in the Bay State, and is quickly becoming reacquainted with New England winters. While she’s been busy meeting campus leaders and familiarizing herself with constituent needs, she took a few minutes to reflect on her route to Storrs and the workings of libraries today. How did you get into libraries? Growing up, were you an avid reader? When I was a kid, the bookmobile came to my rural neighborhood every other week and you were allowed to borrow five books. I can remember being in grammar school, I’d walk about a mile to it, take my five books, my best friend would take her five books, and we’d switch halfway through the week. When I was 15, I got a work permit (you needed to be 16 to work) and my first job at the public library, so I’ve been actively working in libraries for more than four decades. They’re in my blood somehow. Are you still a reader? I am a devoted mystery reader. At the University of New Mexico, we acquired Tony Hillerman’s personal papers. He was one of my favorite authors. After he died, I spent a lot of time with his oldest daughter and his wife, who provided insights into his life and work as well as support to develop a portal that serves as a comprehensive resource for information about him. I felt I knew the culture and landscapes that make up New Mexico well before ever interviewing there by reading Tony’s novels. You’ve spent considerable time working in academic libraries. They’ve clearly maintained your interest. What’s on the horizon for them and for UConn? It is a really exciting time for libraries. In all the years I’ve worked in libraries it has never, ever been boring. I remember the first time I barcoded a book, well before everything we bought had a barcode, and I added records to the first online catalog which replaced the print card catalog. Librarians were active on the Internet pre-graphical interface, pre-web. It’s often said, libraries aren’t so much about the building, but about the content that resides in them and how we deliver that content. I am proud of my profession. Librarians are often at the forefront of innovative ways to serve our users and are called upon to deliver information in all format types – electronic, print, and increasingly important, raw data. For example, recently passed federal legislation requires that all the output from federally funded research be made publicly accessible, not just the final article but the data itself. The UConn Libraries are quickly working to answer that call, with the launching of the Connecticut Digital Archive (CTDA): www.ctdigitalarchive.org. The CTDA is a collaboration of the UConn Libraries and the Connecticut State Library, which will allow us to work with faculty to preserve their research data as well as allow us to provide a much broader service to the state’s citizens. The Digital Archive will also preserve and make available digital assets related to Connecticut, created by Connecticut-based libraries, archives, galleries, and museums. It will allow the digital preservation of the history of Connecticut through documents that are unique. We are also working, as are many other academic libraries across the country, to transition from large print journal collections to electronic journals, while retaining certain print materials, especially those that are unique and don’t translate well into an electronic format. Those materials, many of which are held in our Archives & Special Collections, are vital to maintain. Such materials will help to define the library of the future. Our library will not just be a place that looks like every other research library housing the same collections, but will be known by what has been acquired, collected, preserved, and made available that nobody else has. Libraries are known for providing quiet space for individual study. Not too long ago, Homer Babbidge Library was reconfigured to allow for increased group study. What other changes are we likely to see? There is still a strong need for that intense, quiet space to study. Students don’t have it in their dorms or in the Student Union. We probably need more quiet study space today, not less, but we also need to figure out how to get more collaborative space or what I call “culturally sensitive, technology-enhanced” collaborative learning space. As we reformat the content of the library and free up space, it is still with the intent of meeting the needs of the constituents who have traditionally met each other in the stacks serendipitously. Now, they’re going to meet each other more deliberately in highly functional, interdisciplinary collaborative spaces. How do the regional campus libraries fit into your sense of the future? The regionals play an important role in serving their communities and the students in their communities. Thankfully, there is a strong group of directors at those campuses who are aligned closely with us and who make sure they have all the same electronic resources. A student who is enrolled at Avery Point has the same level of materials as if they were enrolled at the Storrs campus. In principle, the access has to be equitable even though their needs are different. What’s on your immediate agenda? I’m very excited to engage with our current donors and learn more about why the library is a special place for them. I also hope to reach out to a new generation of library users and tell our story. Since we are assessing our materials and their usage, I’m working to reframe the conversation to one where we talk more about stewardship, content reformatting, and preservation. Although the usage may be low for a book in the middle of a densely populated campus like this, we’re anticipating that the need still exists, not that it’s going to be met elsewhere. When we make an investment in preserving something, whether it be here or a different facility off campus, we have to believe that the need for it still exists. How about your personal agenda? You mentioned you’ve already prepared yourself for winter by buying new boots. What else are you doing to settle in and make yourself at home? I bought a snow blower and I know how to use it! I now own a home in the area and am getting to know the neighborhood. I am looking forward to finding new areas for hiking and exploring the cultural arts around me. I have also been pleased to be able to spend time with my family in Massachusetts. There are five lively generations in my immediate family and I have more ability to enjoy them now that I live close by. A new BBC two-part history of the blues, Blues America, produced and directed by Mick Gold, takes you from W.C. Handy’s encounter with street performers of the blues in the early 1900s, through decades of sounds that defined the genre, to President Obama celebrating the blues in the White House in 2012. That interest in documenting and preserving not only blues musicians but also other African American musical genres has led to the Samuel and Ann Charters Archives of Blues and Vernacular African American Musical Culture, donated to Archives & Special Collections at the UConn Libraries in 2000. The collection is known for its blues sources but covers jazz, ragtime, gospel, Caribbean, Cajun and Zydeco and rap and hip hop, from African-American spirituals to Tupac Shakur. The Archives holds thousands of hours of recorded music on LP, 45 rpm and 78 rpm records, compact discs, audio cassettes, and reel-to-reel tapes. In addition to his own collection, Charters has gathered recordings from the catalogs of record companies started by other music collectors, the complete catalog of Chris Strachwitz’s Arhoolie records, recordings from Bill Belmont’s Fantasy Records and, most recently, the catalog of Gary Atkinson’s Document Records. The UConn Libraries is joining other academic libraries and cultural institutions world-wide in championing responsible and sustainable collections management and preservation through the ongoing transition of targeted collection items from print to digital. Targeted items include materials that users prefer to consult online, such as reference sources, Connecticut and Federal data, and journal articles. Not too long ago, when online access was less prevalent, print journals were considered essential to a research collection and rarely removed. However, as online access has grown to nearly 100,000 online journals available to the UConn community today and users expressed their increasing preference for online access to journal literature, it became clear that we had significant and unnecessary duplication. To address this situation, we began identifying duplicate items across the thousands of print journal titles currently held in the UConn Libraries. In reviewing the items for potential removal, care is taken to follow specific criteria, which includes ensuring that users have what is called “perpetual access.” Once long-term online stability has been determined, the print volumes are offered to other libraries and regional repositories for inclusion in their collections. After a brief waiting period to see if there are any takers, the items are removed from our catalog and pulled from the shelves. 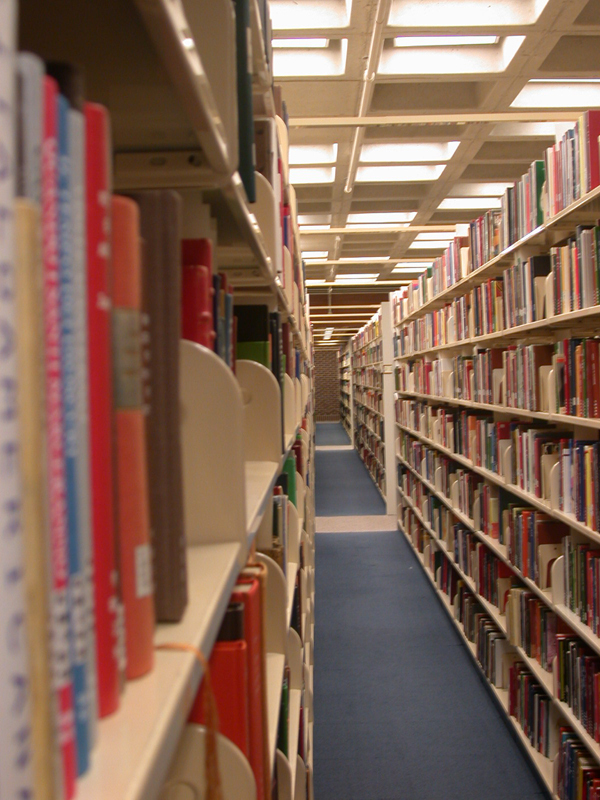 To date we have removed over 155 titles, which equates to the release of over 2,500 linear feet of space on Levels 3 and A in the Homer Babbidge Library. That amounts to about ½ mile of stacks or almost 8 football fields of paper lined up from end to end. While we believe that those numbers are important, it isn’t just about freeing up valuable library space. The goals of the project also include the savings of some of the significant costs associated with storage and maintenance of physical materials. Funds saved can potentially be repurposed to purchase emerging technologies, create needed contemporary learning spaces, and provide more online content. We also believe that the answer to long-term sustainability and stewardship of collection materials will involve increased interlibrary collaboration including off-site storage options for low circulating items and regional collection sharing. For example, we have access to print journal collections housed in the Five College‘s storage facility in Massachusetts and are actively engaged with two dozen colleges and universities in the Northeast Regional Library Print Management Project. This project, funded by the Andrew W. Mellon Foundation, is working to develop a model for which libraries in the Northeast could successfully coordinate shared storage of print materials. This type of regional collaboration has the potential to benefit the individual institutions involved as well as the larger region as a whole. Nationally, the Center for Research Libraries (CRL) is coordinating the preservation of print materials in limited quantities across regions. UConn’s membership in CRL ensures that the UConn community will always have access to print materials when needed. Future collaborations, such as the Digital Public Library of America, will also work to make sure students, researchers, and scholars will have the collections they need to be successful in their work.